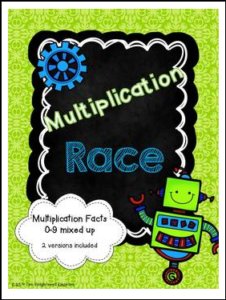 In this fun game, students race against their opponent to complete a set of multiplication problems. Each student has a set of the same problems, while they share one writing utensil. Players take turns completing problems and rolling a die. One player completes as many problems as they can before their opponent rolls a one and wins the pencil. Play continues until one player completes all of the problems on his/her sheet. Multiplication problems cover single digit multiplication using numbers 0-9. This game is a great way to review and practice multiplication facts. Includes 2 versions and an answer key.